Actual Driving time of wheels turning on tarmac, you can only do 4.5 hours without a break. After 4.5 hours you must have 45 min break. The 45 min break can be taken in two periods, first period must be 15 min followed by a 30 min period. Once 45 mins is accumulated, the slate is clean to drive another 4.5 hours. Daily driving in 24 hours is 9 hours. You can increase daily driving twice a week to 10 hours. Rest Period is minimum 11 hours in 24 hours therefore you can be on duty for 13 hours. You can reduce rest period 3 times a week to 9 hours therefore you can be on duty for 15 hours. NB drivers talk about the 15 hours as their three lifelines a week. Remember if you do 13 hours and 1 min you have used a lifeline therefore if you have tarmac, drive time & fit to do so, you can or may as well use the remaining time to gain the advantage. The daily rest period can also be split on a daily basis if you so wish, the total amount of rest required to do this is 12 hours. The first period must be at least 3 hours and the last period must be 9 hours. Weekly rest must be at least 45 hours but this can be reduced to 24 hours. If a reduction is made the reduced time must be repaid en-bloc and attached to another rest period of at least 9 hours before the end of the third week following the reduction. 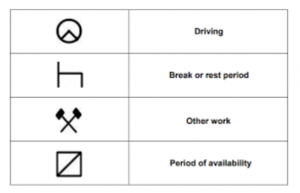 It is possible to reduce two weekly breaks back to back, providing you have taken a full weekly break of 45 hours either side of the reduced breaks. End of day add up; Driving time, Break time, Other work & POA. 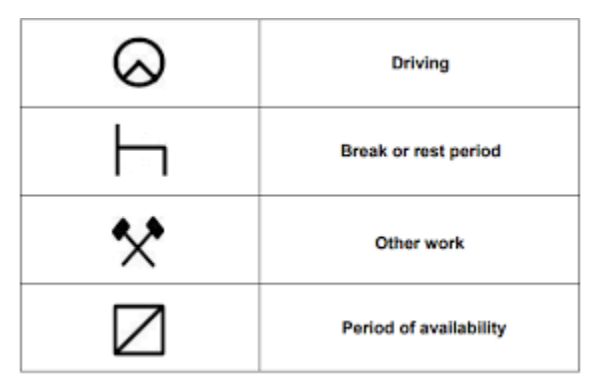 Having this information is vital, balance the books over a fortnight and make sure you’re not over 90 hours of drive time. As for POA and break they don’t add up as work, so flipping to these modes is best practice & essential to overcome WTD of 48 hours a week. Plan your time; other work opening curtains etc. tell fork lift driver give you a shout as am available so go on POA, if he going to be a while tell fork lift driver I’m going for a coffee and put it on break. The Mode Switch is your friend USE IT. • Can the load slide or topple forwards or backwards? • Can the load slide or topple off the side? • Is the load unstable? • Is the load securing equipment in poor condition? • Is there anything loose that might fall off? • Does the vehicle present an immediate likelihood of causing danger of injury due to its load security or stability? The examiner will refer to the load security matrix if they answer ‘yes’ to any of these questions. The matrix helps them decide the appropriate course of action to take based on the risk. A prohibition prevents the vehicle from being moved until the load securing problem is fixed. When a prohibition is issued, the driver is given a fixed penalty notice. The driver then has 60 minutes to fix the problem. If they can’t do this, then the DVSA will immobilise with a release fee incurred. For example, the use of rated lashing straps across the rear of the load to provide security for 50% of the load. This will secure the load in the same way as the rear of the vehicle would for a full load. Don’t use the upper deck for carrying stacked pallets or pallets weighing over 400kg. Secure heavy pallets and stacked laden light pallets on the lower deck with rave to rave lashing or something similar. Laden pallets on the upper deck of double-deck curtain-siders should be single-stacked; and weigh no more than 400kg each. Enforcement bodies have agreed that the use of an extra internal curtain with integral straps designed to hug the load on the upper deck is a practicable means of mitigating the risks of falling objects during unloading and working at height. Arguably an internal strap rated at 750 kilos does more than its job for a light pallet under 400 kilos as long as you assess the load and it is secured to the pallet and unlikely to break down in transit. Generally speaking loads carried on the lower deck and swan neck of a double-deck trailer should be secured as if they were carried on a single deck trailer. Your risk assessment may indicate that for light goods or crushable loads it’s practical to use hanging straps or internal curtains. Where over 400 kilos it must be strapped from body to body.